Naive as we are, we think Southwark should be held to this promise - particularly since it has been made repeatedly over the last 10 years, and made again as recently as March 2012, in the E&C SPD. This promise was also the major justification for moving 1200 households, tenants and leaseholders out of their homes, for demolishing their estate and losing 1200 council homes from the borough. Leader of Southwark Council, Cllr Peter John has been busy this week producing justifications for breaking these promises, which he describes as ‘utterly unrealistic’, despite it being council policy. This has involved a war of words with Lib Dem MP, Simon Hughes. The 35% campaign is not interested in the party political battle - all three major parties have been in power at some point over the last 15 years, they all supported the regeneration plans when they were in power and blamed the other side for its failures when they were not. So they must all take some responsibility for the mess we are in. Cllr John’s administration was however in the hot seat when the crunch came - the deal with developers Lendlease in June 2010, which only secured 25% affordable housing. He is vehement that nothing better could have been obtained and points to an ‘independently verified viability test’ that showed only 7-8% affordable housing could be built. We can’t comment on the validity of this test because several FOI requests to Southwark for viability test information have been refused. Let’s drag this test, and any others, into the light of day so we can judge how accurate they are. Cllr John has also referred to the cuts in public funding for social rented housing as another reason for the loss of affordable housing. The 35% campaign understands that the Heygate site redevelopment was never due to receive public funding for social rented housing - as it doesn’t fulfil the condition of providing more affordable housing than is being knocked down, so the cuts in public funding, while deplorable have no impact on the current situation. Inevitably Cllr John also blames the 2008 financial crisis. Well, as we point out above the E&C SPD, which has the 35% promise, was adopted by Southwark on 20 March 2012, four years after the crisis. 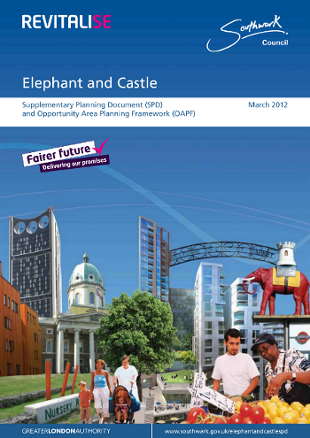 It followed a 2010 affordable housing viability assessment study commissioned by Southwark from bankers BNP Paribas, which said ‘at least 35%’ affordable housing at the Elephant was feasible. It is also in the draft Affordable Housing Policy (June 2011) and the Core Strategy (6 April 2011). Did Cllr John miss these meetings? Whilst Cllr John can be applauded for keeping the ‘affordable rent’ unit rents below the 80% maximum allowed, this is small comfort for those who still can’t afford the £178pw a 1-bed flat would still cost. Finally in his blog Cllr John cites other sites across London were the situation is a lot worse (Battersea Power Stn, Tower Hamlet’s Wood Wharf, Earl’s Court). He then supplies the reason for this - developer power. Developers bully councils with the threat that they will walk away from the scheme and they use their own questionable financial viability assessments to do so. It may be worse elsewhere but to go from 35% to 25%, particularly when much of the 25% is not actually affordable is a loss, not a win. This is not delivering promises and will not make a fairer future.